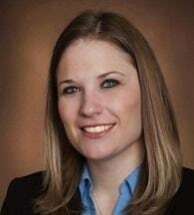 Ms. Curio was admitted to the bar in 2009 after earning her law degree from Rutgers University School of Law in Camden (J.D., 2009) and her undergraduate degree from Penn State University in 2004 (B.A., 2004). While at Penn State, she was a member of the Communication Studies Honor Society and Lambda Pi Eta. At Rutgers, Ms. Curio was a member of the Hunter Moot Court Board and participated in the Child and Family Advocacy Clinic where she represented children in DYFS matters. After law school, Ms. Curio was a Judicial Law Clerk to the Honorable Francis J. Orlando, Assignment Judge of the Superior Court of New Jersey, Camden County from 2009-2010. Ms. Curio is also a member of the Cumberland County Bar Association. Ms. Curio joined the law firm of Gruccio, Pepper, De Santo & Ruth in September, 2010 and currently concentrates her practice in labor and employment law where she has represented clients in mediations, arbitrations, disciplinary proceedings, unfair practice charges, and related labor and employment matters. She has also conducted investigations of employee claims or harassment and discrimination. Ms Curio also handles estate planning maters.